← How Fast Is Fast Enough? I’ve explained how New York City had a life of it’s own in my head. In early August, I visited there for the first time. After my first NYC taxi cab ride, we hit Central Park and were there for hours, despite the jet lag. The next morning we were ready to go and see how much we could cram into our first full day in the city. The so-so weather forecast didn’t phase us. We had been advised (wisely!) to try to group our sightseeing by area. In other words, don’t go from the Empire State Building to the UN to the Statue of Liberty to Yankee Stadium in one day. You’ll spend all day in cabs. So our first set of destinations was along the Hudson River. Specifically, we wanted to get the big picture with a ferry tour around all of Manhattan. Our timing was less than perfect however, and we got there just after one tour left, with the next full tour nearly two hours later. No worries. There was this honkin’ big, grey ship at the next pier upriver. 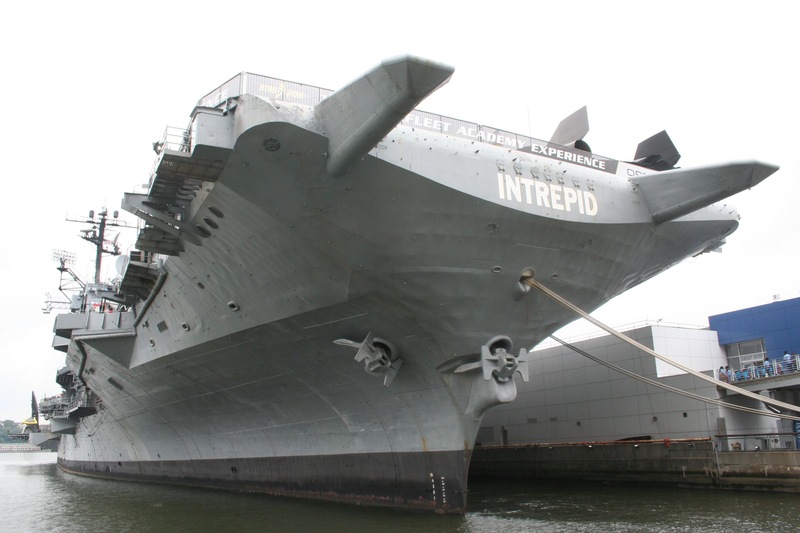 The Intrepid Museum was another “must see” item for me. A retired aircraft carrier, she had been turned into far more as a museum. You don’t realize just how big these things are until you’re up close. The first stop onboard was the other star of the show at this site – Enterprise. While she never flew in space, she was the first of the Space Shuttles. 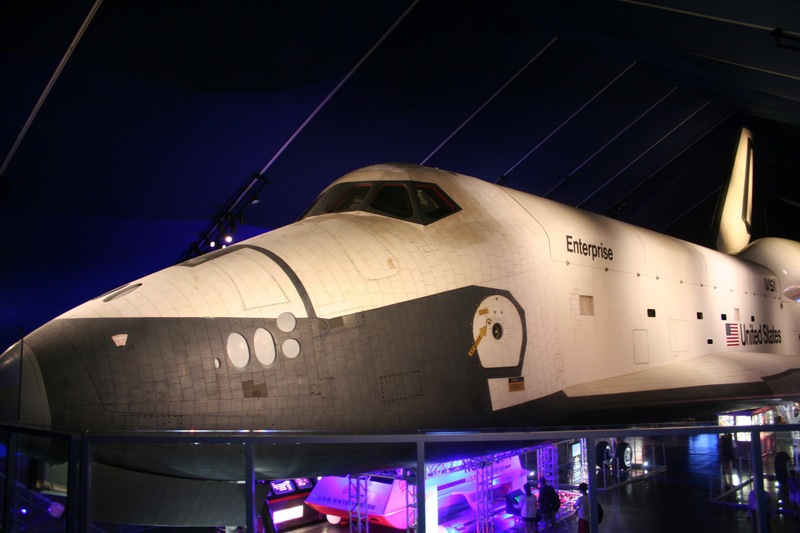 I had actually seen Enterprise previously, when she was at the Udvar-Hazy Museum outside of Washington, DC. 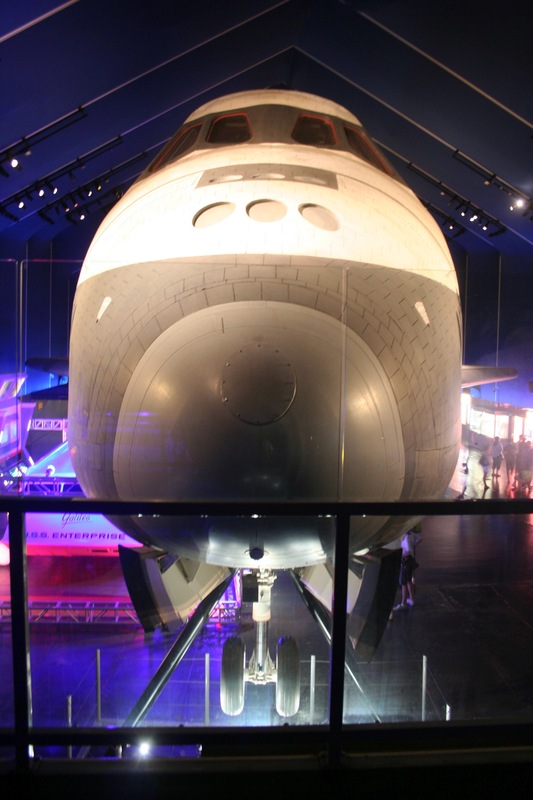 When the Space Shuttle fleet was retired and put into museums, Udvar-Hazy took Discovery and Enterprise was moved to New York City. Enterprise wears the aerodynamic cone that she carried during the drop tests that were conducted prior to the first Shuttle launch. Dropped from the back of a 747, the landing tests proved the Space Shuttle’s airworthiness and performance. 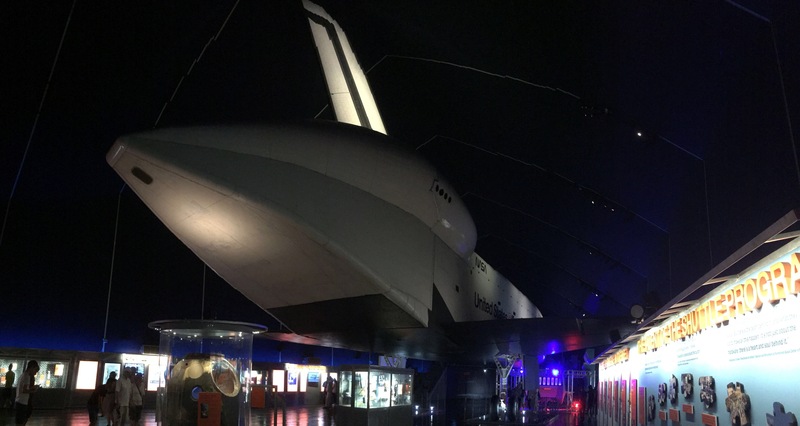 Originally Enterprise was to be converted for spaceflight after those tests, but by that time significant improvements and weight savings had been implemented on Columbia and the other Shuttles to follow. It was deemed to be too expensive to retrofit Enterprise for launch, so she was retired early. Of course, Enterprise got her name after all of the Star Trek fans campaigned for that name. 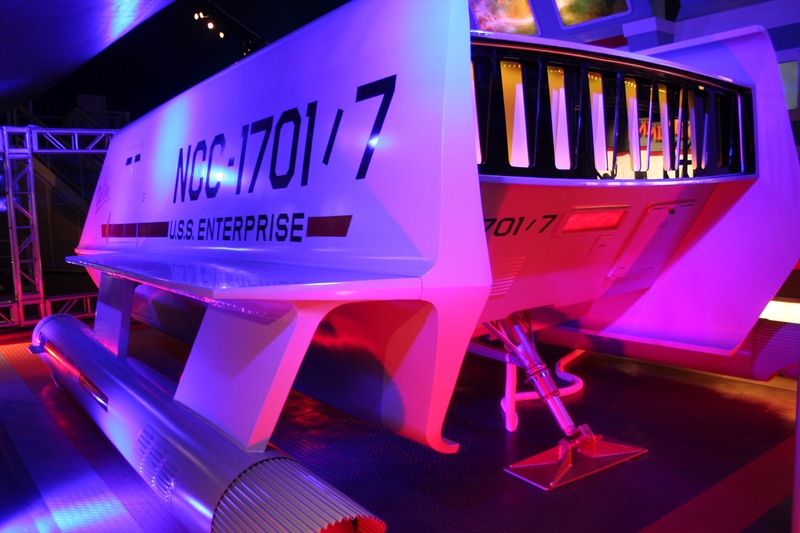 Underneath her in the museum is a model of the Galileo shuttlecraft model used in the original Star Trek television series. Out on the deck of Intrepid there are planes galore. Planes from World War II, Korea, Vietnam, and the current era are lined up side by side on the flight deck. In the far distance on deck you can see an SR-71 Blackbird. The New York City skyline makes a great backdrop to the planes. As you can see, while we were in the pavilion visiting Enterprise, the showers had moved through in earnest. 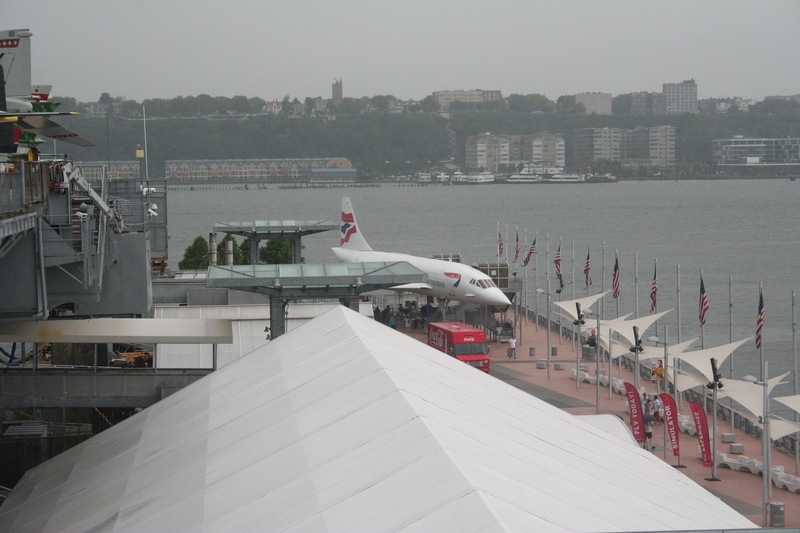 Down at the far end of the dock there is one of the handful of Concorde supersonic transport planes still in existence. 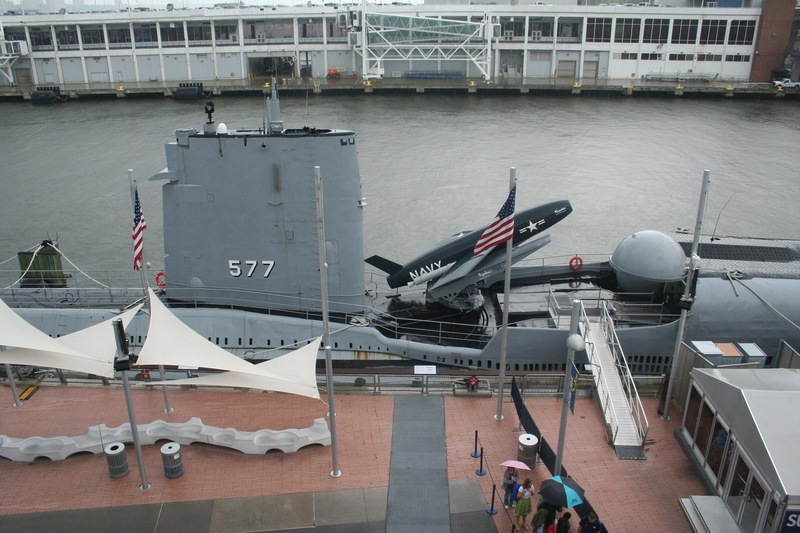 Alongside the dock is a submarine, the USS Growler. It’s the only WWII era, diesel powered submarine open to the public to tour. I didn’t get to tour the Growler or the Concorde due to time constraints. 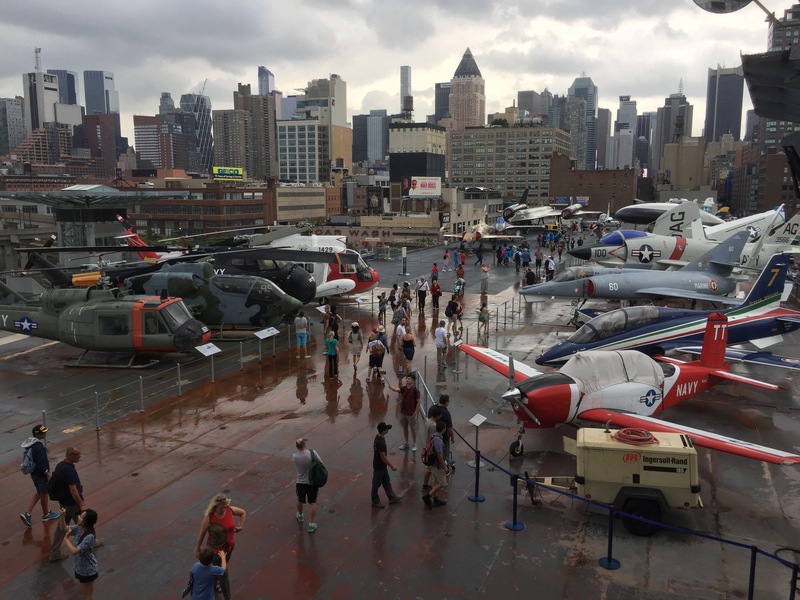 I did have time to do a quick tour of the hangar deck museum, which has many more planes and dozens of displays about the functioning of the Intrepid. I also got time for the tour of the bridge and officer’s quarters. I could have spent four or five hours there easily (next trip! ), but the ferry waits for no man. I and the Long-Suffering Wife had to hustle back downriver a couple of blocks to take our tour around Manhattan.